Although this issue has a tremendous statement about Captain America’s position on law and order versus protest and dissent, on the whole it’s more a set-up for the next two installments, introducing a mysterious new villain and what I’m sure was a very shocking re-introduction of a beloved character in the next issue. In fact, the events of the next two issues make this one seem even crazier… but judging from the exposition on the opening page, Stan and Gene knew what they were doing (and were more than willing to let us in on the joke). The bottom two panels above also recall Cap’s musings in issue #122 about current society’s love of the rebel and dismissal of the older generation, where he also admits (as he does here) that his generation made some mistakes, and that maybe the rebels and protesters have a point after all. But then he takes all of this a little too far, deciding that he’s done with duty—especially if no one appreciates him any more—and he’s throwing in with the selfish hedonists. Clearly, this doesn’t sound like the Captain America we know and love. But consider all he’s been through lately: he feels betrayed by his love Sharon Carter, his pal Nick Fury, and the rest of S.H.I.E.L.D., and at the same time he’s missing having a life outside being the Sentinel of Liberty—a role which itself is increasingly mocked and ridiculed. He’s a man with very little to cling to, and it’s understandable that he would be tempted to grab a little happiness for himself. 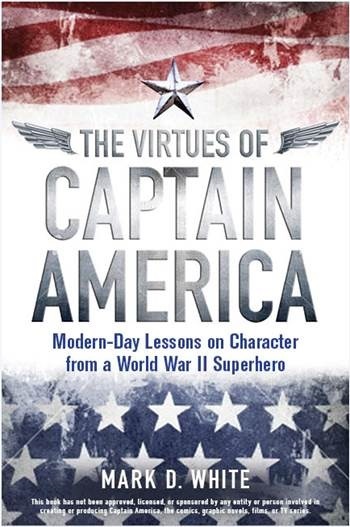 For all his enhancements, Steve Rogers is, after all, just a man, and for all his virtues, he’s not perfect. He’s so low, he even takes an insult from a police officer as a compliment! Of course, as soon as there is danger to be investigated, Cap falls back into character (and costume), showing that even a little ennui cannot defeat his core instincts. …and as then, he is sympathetic to the students’ concerns even as he is critical of the violence used by them and the police. Frustrated (both by this incident and in general), Cap points out the difference between fighters for a cause and those who just want to stir up trouble (although he doesn’t know yet just how right he is). …and this cynicism (and his lack of funds) sets him up for a new scheme. Here, we get the first sight of the mystery villain behind the scenes, the Hood (not to be confused with Parker Robbins from the modern comics). Happily, Cap turns the tables on his new employers, turning their planned speech about law and order into an inspired statement of support for protest and dissent. Below, Cap goes on to caution against the indiscriminate use of violence, but also criticizes authority figures whose silence and stubbornness drive others to violence. Gee, Captain America is exactly like a red-white-and-blue Spider-Man, Mr. Parker, how did I never see that before? The issue ends with Cap defeating the three villains and pledging to find out who put them up to attacking him—with the Hood shaking his fist and swearing revenge… in the next issue.